It is my opinion that Scotland will become independent on the same day that the rUK leaves the European Union: around Xmas 2018. But the ball is not in Scotland’s court – the dynamic that is ripping the UK apart remains English nationalism and the disintegration of the old continuing English constitution. Popular support for independence will not be won by the Yessers converting the No voters – but by the English unionists chewing up and spitting out the Scottish ones. Those of us on the nationalist side must sit and wait patiently. The success of an independent Scotland depends on this digestive process – the higher the support for independence the easier post-independence will be politically. English politics remain deeply unstable. The Labour Party has largely collapsed and must split into at least two parties – maybe three if Scottish Labour goes its own way, maybe four if the Welsh follow. Theresa May’s weak position as the Remainer Prime Minister of a Brexit government is shown by her ludicrous appointment of Boris Johnson as Foreign Minister, and her scurrying up to Scotland at the first opportunity to try and bind the Holyrood Government into the process of finding and agreeing what Brexit will mean. By declaring that there will be no Article 50 until there is an agreed UK response she is holding a gun to her own head and threatening to pull the trigger – it is strategically unwise. Scotland cannot be coerced. The majority of May’s MPs regard Brexit with distaste, the majority of her members are Article50ers. The Tory party remains in a cold civil war. There is a still a huge chasm between the options – is Brexit an EEA, an EEA+ or an EEA-? Is it plain WTO or Canada+, who knows? The logical, obvious and inevitable mechanism for Theresa May to cut this Gordian knot is the traditional way: pick one of the options, declare that as her negotiating aim and hold a general election to stamp her authority on her party and parliament. She would like the SNP to be signed up before. We must be patient, co-operative but intransigent on free movement and the single market. It will be said that free movement and the single market is a wrecking demand. Well let it be said. The vacuum after the Brexit vote, the robust response of the Scottish government, and that endless week where Downing Street was in total disarray allowed Nicola Sturgeon to thrust Holyrood up nearly on the par with Westminster, to reposition the terms of Bute House-Downing Street discourse in the minds of Scottish voters. This ratchet is not a new thing. One of the first acts of the incoming SNP administration was to rename the Scottish Executive the Scottish government – a fait accompli that blithely brushes aside the spirit of the Scotland Act, but one which the opposition would not dare overturn if they came to power. The bonds of the union will be destroyed by the political reaction to this south of the border: Brexit makes Holyrood more intransigent and Westminster more intolerant of that. In some cases this will be a conscious thing – an English nationalism spitting back in contempt – but in most cases it will be simply the thrashing of a confined beast that has never previously had to think about the adjuncts of England very much. Every step Theresa May will have to take to consolidate her position south of the border will be taken on Brenglish grounds, in response to Brenglish pressures. It is entirely inconceivable that we can go through to 2020 via Brexit with a government elected on a totally different basis and a majority of 12. The political task Theresa May faces, that of defining and implementing an actual exit from the EU, is horrendous. There is no mechanism to resolve it within the Tory party – it must be done on the doorstep. And if you thought the Brexit vote was ugly, wait til you see the coming election. Labour will be trashed in the north of England by UKIP, and trashed in the south by the Tories – if there is even a single Labour Party by then. For the SNP is not the only one lying in waiting, the UKIP wolf is at the door, and it is scarcely Brenglish. 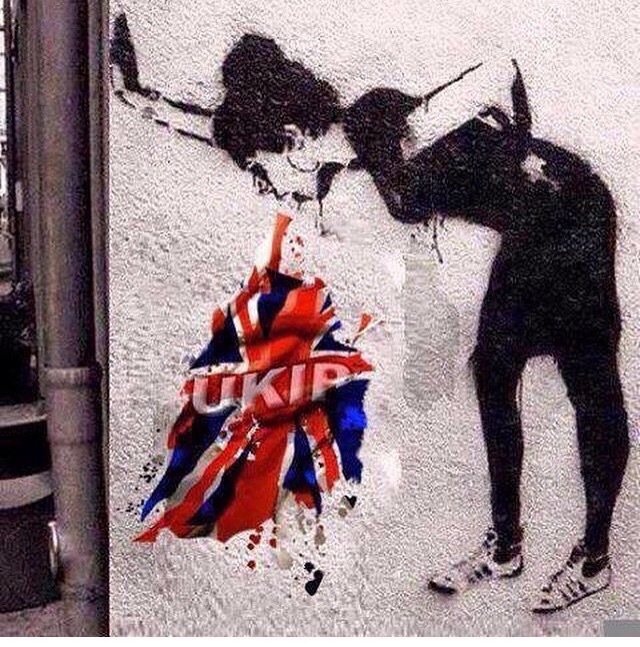 It is easy to write off UKIP on the grounds that they are nowhere in the polls, but nobody is talking about them. It is worth remembering that in the run up to the 2011 Holyrood elections Labour ran a continual lead in the headline voting-intention polls. Labour’s fundamentals were terrible and it duly lost. It is not clear how we get to independence from here though. The Westminster government is committed on paper to vetoing another referendum, although that is a bit of paper tiger. The absence of a constitution, the ad-hoc nature of the British state, means that the Westminster government has an almost total lack of servants under its control north of the border, no police, no prison officers even, with the exception of the Civil Nuclear Constabulary. I’m sure constitutional judges sitting in London may well come up with some declaration that a referendum is ultra vires but it is not clear how it could be stopped; short of martial law. If there is a referendum it is likely to be short and quick, not a rerun of the 2014 marathon – possibly following the snap election that Mrs May will engineer. The Fixed Term Parliament Act is, of course, not-entrenched in the unwritten constitution, and like everything else can be finessed. Or it may be that the SNP goes into the snap Westminster election on a manifesto for independence. The unnerving thing is that the SNP must simply remain firm whilst the UK shakes itself to pieces, a island of stability in a sea of change. The game has long passed out of our control. There is in Scottish nationalism a strange strand of Scotland being continuity Britain, and in that spirit: steady the Buffs. UK politics will remain turbulent for a good while yet, and the sources of that turbulence will remain that peculiarly Brenglish nationalism of the Brexiteers. An entertaining article, but anyone who thinks that the EU is “a union of equals” really hasn’t been paying attention. Spot on David. Even on basic economic terms, Germany likes to run an economic surplus, and as they are the most powerful European voice, thats what they do. This means that someone within the Euro area has to run a deficit, most notably Greece in recent years. Running your country within EU regulations on trade and commerce, using an EU wide currency over which you have little control whilst running a deficit is not a great place to be. Well, in relative terms it is. Germany is influential, but unlike England in the U.K. it is not the only part of the Union that the parliament in Strasbourg or the Commission in Bruxelles listen to. Moreover, the small EU members either as a club or on their own are a force to be reckoned with. Scotland in the EU would be less ignored than Scotland in the U.K. The Union is a bit of a lash-up, so there is still scope for individual actions by countries, which the others then have to swallow, such as Germany’s unilateral opening of its borders (well for a bit, now being unwound). As the largest and richest state in the union, that gives Germany some clout. To block an initiative, you would need a minimum of four states representing 35% of the EU population, so it isn’t “equal” in the sense that one state is worth the same as another. The Commission is another point to consider. It is an activist body and the larger states are typically going to have more of their nationals on the staff. You dismiss far too easily the Labour Party south of the border – a very different animal to SLAB. There is a real genuine battle to take back the LP from the Blairites which is not happening in Scotland, as many there are still under the illusion that the SNP is somehow progressive. Corbyn’s 10 pledges are something all to the left of the Tories can unite under; I’m not at all sure that UKIP will succeed in stealing any Labour clothes in a GE. Last poll showed Labour just 7 points behind the Tories. Corbyn is unable to do basic political tasks like respond to the court hearings on Brexit – the idea that his Labour Party is capable of fighting a general election in any sort of a coherent manner strikes me as ludicrous. I don’t think you can talk about this as just being about Scotland – a federal solution requires the acquiescence of English federalists, of whom there are precisely none. It’s hard to grasp the complexity of politics in the British Isles right now and this is an admirable try. But I tend to agree that it’s too easy to write off Labour south of the border. Two-thirds of Labour supporters were for remain and JC may yet realise that it’s a bit daft to leave it to the Lib Dems to represent them. Those two-thirds certainly aren’t going to switch to UKIP and it’ll probably only be the xenophobes among the rest who do, though admittedly that could lose seats in some places. There was once talk about the settled will of the Scottish people and I wonder what that is now, and what it may look like in 2018. The crude choice is between some kind of attachment to Europe (which, apparently, not all SNP voters support) and some kind of attachment to the UK. We can guarantee, I think, a reincarnation of Project Fear, and however optimistic I would like to be that we’d choose the former, is Alex Salmond right to hope that the desirable 55 – 60% of Scots will make that leap? I think Nicola’s punt on what is a sort of federalised solution is actually pretty close to the centre of gravity, but that doesn’t mean that it amounts to a consensus. Actually, if the SNP had fought Indyref 1 on the basis of their white paper, which was a thinly-disguised bid for a confederal status (with added gunboats), they might have edged it. Pretending it was independence when, in important respects it wasn’t, just created confusion and distrust. And I doubt if a second referendum is the right way forward anyway. As we’ve seen, it’s a rotten way to make complex decisions and it separates those complexities from all the other issues that governments must confront. Far better for the SNP to go to the country on an unmistakeable manifesto promise to deliver independence (or a confederation, if that is judged more attractive) and live with the consequences. How can this be done (the confederation option) ? It sounds exactly like Devo+ which is surely impossible to put down on paper ? It would require Westminster to pre-negotiate all the new devolved powers and tell Scots exactly what they would be getting before the vote. That simply isn’t going to happen. The other route is to re-run 2014, with project Fear and Westminster promising ‘more devolution if we vote No’ and that simply won’t wash with the Scottish public, especially after Calman, The Vow and the new Scotland Act. Chuck in the ongoing negotiations that Westminster has with Europe, the lack of expert negotiators and civil service to carry out the task of Brexit and we see the UK govt simply doesn’t have the manpower to deal with a new settlement for Scotland at the same time. It would be similar to Hitler opening up a second front in Russia, utterly disastrous. The only route open that I see is a one question, full independence option in a referendum and I think that will become clear in the next few months as Westminster dismiss any alternative Scottish proposals. Agree that we are living in unstable times. But politicians don`t like to go into any election to “live with the consequences”. Our present band of SNP MSPs are no doubt enjoying their existence…and turkeys don`t vote for Christmas. Think of the coming conflict as a sports journalist would write about it. Compare the talents, committment, morale of the team captain, the players, supporters of the two sides. Whether immediately independent or not, Scotland will come through Brexit and land on its feet. Neither the Westminster System, not those who operate it to their advantage, are fit for the task. If they were, we wouldn’t have got to where we are. I’m relaxed about the risks. Some of the weaknesses of the opposing side are listed above, but by no means all. They are certainly losers. There are a number of things wrong with this article, but the prescription for the ‘nationalist’ (by which I assume the other means pro-independence) movement to simply ‘sit and wait’ is not just wrong but dangerous. Political passivity and waiting on events is not a strategy – it’s what you do when you don’t have a strategy. In any case, the ‘strategy’ outline on relying on the supposedly rampant popularity of the European Union in Scotland and Tory intransigence to convince former No voters simply will not work. Scottish independence is never going to be a conservative proposition. It’s always, by definition, going to be radical and path-breaking. The attempt by some in the Yes movement to turn the campaign for a new state into a campaign for ‘stability’ is baffling and self-defeating. Scotland’s independence was won in May 2015 when 56 out of 59 of Scotland’s MP’s were elected for the SNP. Now would be a good time for the 56 to do the honourable thing, before May ‘triggers’ Article 50 and Scotland is removed from the EU.